Home » God-Bites: Can war ever be just? 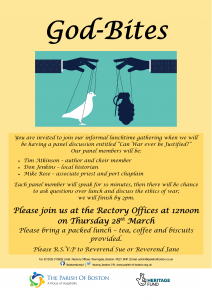 On 28th March we were joined by Tim Atkinson and Mike Rose for a thought- provoking discussion on the topic of just war “Can war ever by justified?”. Unfortunately, Don Jenkins, local historian, was unable to join us due to illness. Tim used to be a teacher and is now a full-time author; Mike has served in the Royal Navy, and is now an associate priest in our parish, and Port Chaplain for the Seafarer’s Mission. Both Tim and Mike read philosophy at Hull University. Tim opened the session by reminding us about the horrors of warfare, and how war had been a feature of human history forever. He went on to explain how Thomas Aquinas had tried to reconcile the Christian doctrine of peace with the apparent need for war and argued that WW1 saw the Just War conditions irrevocably destroyed. Tim made the point that we can’t un-invent the weapons of mass destruction that now characterise all war. Pacifism is not a credible position. And so-called ‘Just War’ theory is no longer fit-for-purpose. We need to think again, and quickly! Mike talked about religious justification for war, the Second World War and modern wars such as the Iraq War. He provided statistics of non-combatant and military deaths, and how war is justified today. He explained the doctrine of the Double Effect, both in war and in medicine, (the notion that actions can have unintended consequences), the strengths and weaknesses of pre-emptive strikes and proportionality. We had a wide-ranging discussion which covered aspects such as how war is depicted in the Old Testament; the Christian understanding of war; pacifism and Christians who refuse to fight in wars; conscription, and how violence seemed to effect those who grew up after the second world war. The next God-Bites session will take place on Wednesday 23rd May when we will be joined by the Reverend Dr Sally Myers, Principal of the Lincoln School of Theology who will be talking about Faith and Politics.